what is going on in this line of assembly code? 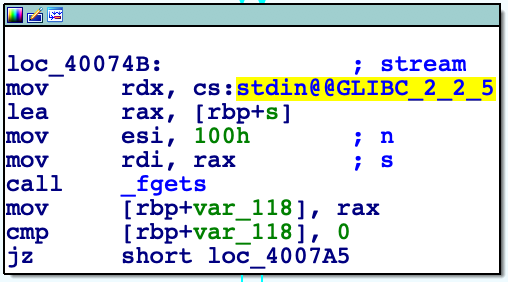 Appears to be setting the file for fgets (man 3 fgets) to read to stdin. Then calls fgets and goes elsewhere if nothing read. Ahhh, I've been thinking I should have tried to explain that better, although I do NOT claim to know C! The C Standard Library contains open(). read(), write(). etc. - equivalent (?) to the system calls you're probably used to. It also includes fopen(), fread(), etc. If you learn C "from the book", it probably tells you to use fread(), etc. and may not even mention that the other versions exist. The difference is that the "f" versions are "buffered I/O". These use a "different stdin" (etc.) than the small integer "STDIN" you'd use for system calls. This "stdin" (I think) is the address of a structure which knows where the actual buffer is and the current position in the buffer 0 as well as STDIN=0, I suppose. If you're not aware that you've asked for buffered I/O, the results may not be what you expect. "cs" is a segment register, but in this case it's a segment override - the address of "stdin" is with respect to section .text rather than .data or .bss. "fgets" itself would be in .text, although the address of it might be found elsewhere(?). I think IDA is adding that (and the underscore on "fgets). I don't think you'd need them if you were writing the code yourself. So by "segment override" that means that the cs register will have whatever was stored in it before replaced with the segment starting address for the "GLIBC_2_2_5" segment?